If you’re a fan of Death Note as I am, then you’ll know that recently there was a third movie speaking towards L’s short life after Kira. 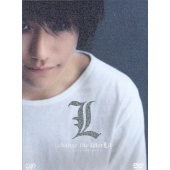 And that would be the movie, L – Change the World. I have to say that it was very fortunate that I happened to be in San Francisco, the day that they were going to premier the DVD screening at New People World. I picked up a copy of the movie and got a free screener pass along with a “L” button. Depending on what you’re looking for, you might want the US version of this DVD set. Either way, I have to say that it was actually pretty good. I happen to like the Death Note writing a bit better, so the plot of the spin-off was a little more hokey. But overall, it does fill in some of the blanks that the anime itself doesn’t on why the character L actually had successors and where they came from. In fact, there was definitely a nice touch where it overlaps at the beginning with the timeline of the Kira case, in which if you’ve never seen the previous movies, I would definitely recommend watching them in order, watching the anime, or reading the manga before watching this film. It would explain a lot of things such as the naming of Near. Overall, this movie was anti-climatic when it comes to the end, and I wasn’t surprised but sort of disappointed that you didn’t get to follow L to the very end. It’s kind of like one of those westerns where the hero rides into the sunset and leaves the entire thing open and you’re going… wait a second… where’s the rest of it? I have to say that Cold Stone Creamery has hit on something big. Like seriously needs to go into their repertoire quick. Currently, they’re promoting a $9.99USD limited time special for six ice cream cupcakes. From left to right, we have Sweet Cream, Cake Batter Delux, and Double Chocolate Devotion. The technical of these cupcakes are actually pretty simple. It’s a chocolate shell, where the cake goes on the bottom, the ice cream above it, and then topped with frosting and some type of topping. But it truly is something that has a lot of weight on hot sunny afternoons and with the current cupcake craze around the United States, it’s bound to do well. Sweet Cream: yellow cake, fudge & sweet cream ice cream, white frosting, milk and white chocolate curl. Cake Batter Delux: red velvet cake, fudge & cake batter ice cream, pink frosting, rainbow sprinkles. Double Chocolate Devotion: devil’s food cake, fudge & chocolate ice cream, white frosting, Oreo cookie. Truly pick your poison. If regular cupcakes at bakeries can sell for $3USD a piece, then these things are tremendously under-valued and under-priced. In all truthfulness, I could actually seeing paying up to $5USD for a custom cupcake. Think about it. Most of the ingredients are already set up, so that you can already have shells with cake ready to go, pick your own ice cream, frosting, and topping. It’s a lovely move from a business perspective, and turns long hot summer days into something wonderful. What’s even better is that there is also the possibility of say hot fudge for colder weather. There’s definitely a lot of maneuvering room for the product manager that is in charge of this one. Currently? You pay about $1.70USD per cupcake, and from what I saw they usually make about two batches a day since they sell out in about half day. I don’t think it’s caught on yet how awesome these things are, but believe me… anyone that touches these will not stop at one. What the heck was I thinking in waiting so long?? This movie is absolutely fantastic and one of those that really don’t give away the ending until probably closer to the end. Which I appreciate since there are too many predictable movies out there. Jim Carrey plays Joel, whom is having his memory erased because his girlfriend had her memory erased of him. While he’s in the middle of this process, he realizes that he doesn’t want to lose her and tries frantically to save any memory of her. What was absolutely great with this movie, and I made the connection here with Adam Sandler in Reign Over Me, is that it really seems that the comedic actors have a lot of depth when it comes to acting abilities. Even Jamie Fox, whom has had a multitude of serious roles has shown that while they all started in comedy, they can play serious parts extremely well and that there is more to it than one-sided acting. The movie itself was fantastic and I urge anyone that likes drama to watch it, especially if they have Roku box. If you don’t have one, I would seriously advise you to look into getting one since it increases your Netflix account without any further cost outside the initial $99USD. In any case? Watch the movie. Yar. I have to admit that I have yet to try all of the food yet. Only been there twice, and both times I insisted on Japanese since that’s what I usually crave since it’s a bit more difficult to get good Japanese food in the South unless you’re a big fan of hibachi. But I have to admit, I found a new favorite place for my tummy. And what the tummy wants, the tummy gets. To a degree. In any case, the decor on the inside was fabulous, and well done. Something that you’d never would have known from the outside decor due to the fact that it’s in a strip mall. From a cuisine perspective, you’re probably looking at a decent valued meal unless you go ballistic and order several of the ten dollar rolls. They serve Thai, Chinese, and Japanese cuisine and all of the waitresses are extremely friendly. I actually had a chance to meet the owner at one of my NAAAP meetings and found that we actually knew a mutual friend. In either case, the food was great, the value is good, and you really can’t get anything better than this around the Winston-Salem area. At least not to my knowledge. There are definitely other reviews out there so don’t take my word for it. But I can tell you that both my wife and I have found a new restaurant that we adore. Oh, and one other thing since the Triad restaurants always have incredible crazy wait times during the Friday and Saturday dinner crowds. You don’t have to wait here. It’s one of those diamonds in the rough that people haven’t discovered yet. Nestled in the shadow of the Hanes Mall across from Allegacy credit union, this place is definitely an asian foodie’s choice.